Our PREMIUM BAMBOO MAGNETIC KNIFE STRIP AND UTENSIL HOLDER is made of HIGH QUALITY, ETHICALLY SOURCED bamboo wood. Our premium bamboo magnetic strip is idea for your kitchen knives, scissors, and utensils, but is also ideal for your tools, including pliers, screwdrivers, wrenches, sockets, and more. Great for the kitchen or the tool room. Our magnetic strip has six separate magnetic locations to support various sizes of knives, tools, or utensils. Having six separate magnets is preferable because it makes the strip lighter, easier to mount, and it prevents your items from magnetically snapping into place against each other, preventing damage or scratching. Our premium bamboo magnetic strip includes mounting harware for drywall but can also be mounted with command strips on your tile wall or backsplash. We recommend a heavy duty staple gun to attach your command strips to the back of the strip. Regular mounting hardware includes drywall anchors and screws. The beautiful Frederica Trading logo is carefully laser engraved in the lower right corner of each magnetic strip, providing an elegant, classy look for both function and decor. 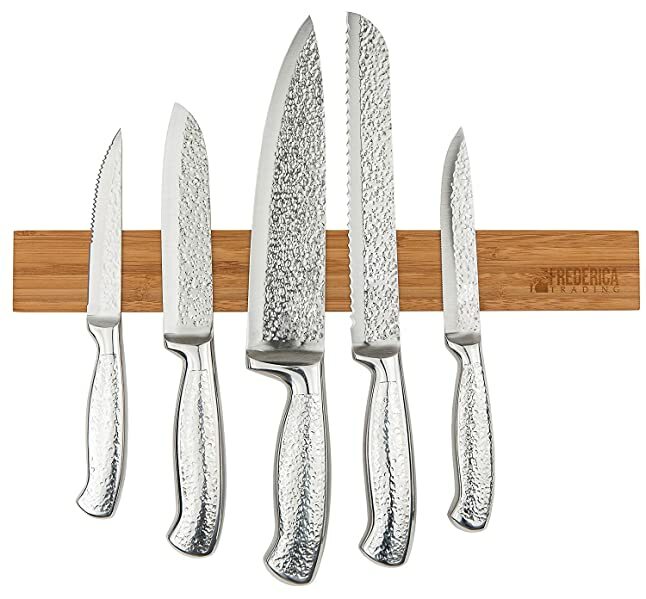 Frederica Trading's wooden magnetic knife strip is not only functional, it's a beautiful decoration for your kitchen, break room, bar, garage, toolshed, or RV. The beautiful, natural bamboo wood and logo display your knives perfectly!